1 A None No Power Seat 1 A is a standard Business Class Bulkhead seat whose proximity to the galleys may be bothersome. 1 E None No Power Seat 1 E is a standard Business Class Bulkhead seat whose proximity to the galleys may be bothersome. 1 F None No Power Seat 1 F is a standard Business Class Bulkhead seat whose proximity to the galleys may be bothersome. 1 K None No Power Seat 1 K is a standard Business Class Bulkhead seat whose proximity to the galleys may be bothersome. 16 A None No Power Seat 16 A is a standard Economy Class seat that may have restricted legroom due to the position of the bulkhead. The tray table is in the armrest, making the armrest immovable and slightly reducing seat width. There is no floor storage for this seat during take-off or landing. 16 C None No Power Seat 16 C is a standard Economy Class seat that may have restricted legroom due to the position of the bulkhead. The tray table is in the armrest, making the armrest immovable and slightly reducing seat width. There is no floor storage for this seat during take-off or landing. 16 H None No Power Seat 16 H is a standard Economy Class seat that may have restricted legroom due to the position of the bulkhead. The tray table is in the armrest, making the armrest immovable and slightly reducing seat width. There is no floor storage for this seat during take-off or landing. 16 K None No Power Seat 16 K is a standard Economy Class seat that may have restricted legroom due to the position of the bulkhead. The tray table is in the armrest, making the armrest immovable and slightly reducing seat width. There is no floor storage for this seat during take-off or landing. 17 C None No Power Seat 17 C is a standard Economy Class seat that may have extra legroom due to the missing seat in front however, other flyers tend to bump into this seat. The tray table is in the armrest, making the armrest immovable and slightly reducing seat width. There is no floor storage for this seat during take-off or landing. 17 D None No Power Seat 17 D is a standard Economy Class seat that may have extra legroom due to the position of the bulkhead. The tray table is in the armrest, making the armrest immovable and slightly reducing seat width. There is no floor storage for this seat during take-off or landing. 17 E None No Power Seat 17 E is a standard Economy Class seat that may have extra legroom due to the position of the bulkhead. The tray table is in the armrest, making the armrest immovable and slightly reducing seat width. There is no floor storage for this seat during take-off or landing. 17 F None No Power Seat 17 F is a standard Economy Class seat that may have extra legroom due to the position of the bulkhead. The tray table is in the armrest, making the armrest immovable and slightly reducing seat width. There is no floor storage for this seat during take-off or landing. 17 H None No Power Seat 17 H is a standard Economy Class seat that may have extra legroom due to the missing seat in front however, other flyers tend to bump into this seat. The tray table is in the armrest, making the armrest immovable and slightly reducing seat width. There is no floor storage for this seat during take-off or landing. 29 A None No Power Seat 29 A is a standard Economy Class seat however, the proximity to the lavatories and galleys may be bothersome. 29 B None No Power Seat 29 B is a standard Economy Class seat however, the proximity to the lavatories and galleys may be bothersome. 29 C None No Power Seat 29 C is a standard Economy Class seat however, the proximity to the lavatories and galleys may be bothersome. 29 D None No Power Seat 29 D is a standard Economy Class seat however, the proximity to the lavatories and galleys may be bothersome. 29 E None No Power Seat 29 E is a standard Economy Class seat however, the proximity to the lavatories and galleys may be bothersome. 29 F None No Power Seat 29 F is a standard Economy Class seat however, the proximity to the lavatories and galleys may be bothersome. 29 H None No Power Seat 29 H is a standard Economy Class seat however, the proximity to the lavatories and galleys may be bothersome. 29 J None No Power Seat 29 J is a standard Economy Class seat however, the proximity to the lavatories and galleys may be bothersome. 29 K None No Power Seat 29 K is a standard Economy Class seat however, the proximity to the lavatories and galleys may be bothersome. 30 A None No Power Seat 30 A is a standard Economy Class seat that has extra legroom due to the exit however, the proximity to the lavatories and galleys may be bothersome. The tray table is in the armrest, making the armrest immovable and slightly reducing seat width. There is no floor storage for this seat during take-off and landing. 30 B None No Power Seat 30 B is a standard Economy Class seat that has extra legroom due to the exit however, the proximity to the lavatories and galleys may be bothersome. The tray table is in the armrest, making the armrest immovable and slightly reducing seat width. There is no floor storage for this seat during take-off and landing. 30 C None No Power Seat 30 C is a standard Economy Class seat that has extra legroom due to the exit however, the proximity to the lavatories and galleys may be bothersome. The tray table is in the armrest, making the armrest immovable and slightly reducing seat width. There is no floor storage for this seat during take-off and landing. 30 H None No Power Seat 30 H is a standard Economy Class seat that has extra legroom due to the exit however, the proximity to the lavatories and galleys may be bothersome. The tray table is in the armrest, making the armrest immovable and slightly reducing seat width. There is no floor storage for this seat during take-off and landing. 30 J None No Power Seat 30 J is a standard Economy Class seat that has extra legroom due to the exit however, the proximity to the lavatories and galleys may be bothersome. The tray table is in the armrest, making the armrest immovable and slightly reducing seat width. There is no floor storage for this seat during take-off and landing. 30 K None No Power Seat 30 K is a standard Economy Class seat that has extra legroom due to the exit however, the proximity to the lavatories and galleys may be bothersome. The tray table is in the armrest, making the armrest immovable and slightly reducing seat width. There is no floor storage for this seat during take-off and landing. 31 D None No Power Seat 31 D is a standard Economy Class Bulkhead seat whose proximity to the galley may be bothersome. The tray table is in the armrest, making the armrest immovable and slightly reducing seat width. There is no floor storage for this seat during take-off or landing. 31 E None No Power Seat 31 E is a standard Economy Class Bulkhead seat whose proximity to the galley may be bothersome. The tray table is in the armrest, making the armrest immovable and slightly reducing seat width. There is no floor storage for this seat during take-off or landing. 31 F None No Power Seat 31 F is a standard Economy Class Bulkhead seat whose proximity to the galley may be bothersome. The tray table is in the armrest, making the armrest immovable and slightly reducing seat width. There is no floor storage for this seat during take-off or landing. 43 A None No Power Seat 43 A is a standard Economy Class seat in the last row of the aircraft whose proximity to the lavatories and galleys may be bothersome. 43 B None No Power Seat 43 B is a standard Economy Class seat in the last row of the aircraft whose proximity to the lavatories and galleys may be bothersome. 43 C None No Power Seat 43 C is a standard Economy Class seat in the last row of the aircraft whose proximity to the lavatories and galleys may be bothersome. 43 H None No Power Seat 43 H is a standard Economy Class seat in the last row of the aircraft whose proximity to the lavatories and galleys may be bothersome. 43 J None No Power Seat 43 J is a standard Economy Class seat in the last row of the aircraft whose proximity to the lavatories and galleys may be bothersome. 43 K None No Power Seat 43 K is a standard Economy Class seat in the last row of the aircraft whose proximity to the lavatories and galleys may be bothersome. 44 D None No Power Seat 44 D is a standard Economy Class seat in the last row of the aircraft whose proximity to the lavatories and galleys may be bothersome. 44 E None No Power Seat 44 E is a standard Economy Class seat in the last row of the aircraft whose proximity to the lavatories and galleys may be bothersome. 44 F None No Power Seat 44 F is a standard Economy Class seat in the last row of the aircraft whose proximity to the lavatories and galleys may be bothersome. 6 A None No Power Seat 6 A is a standard Business Class seat whose proximity to the bar and lavatories may be bothersome. 6 E None No Power Seat 6 E is a standard Business Class seat whose proximity to the bar and lavatories may be bothersome. 6 F None No Power Seat 6 F is a standard Business Class seat whose proximity to the bar and lavatories may be bothersome. 6 K None No Power Seat 6 K is a standard Business Class seat whose proximity to the bar and lavatories may be bothersome. 7 E None No Power Seat 7 E is a standard Business Class Bulkhead seat. 7 F None No Power Seat 7 F is a standard Business Class Bulkhead seat. 7 K None No Power Seat 7 K is a standard Business Class Bulkhead seat. All Business and Economy Class seats have access to an AC power port. For a fee, passengers can access the internet via on-board Wi-Fi, as well as have the ability to use their smartphones to make calls, send texts, and send emails during the flight. Qatar Airways operates the Airbus A350 on a variety of long-haul flights. This aircraft is configured with only two classes of service where all Business Class seats feature 180 degree recline. 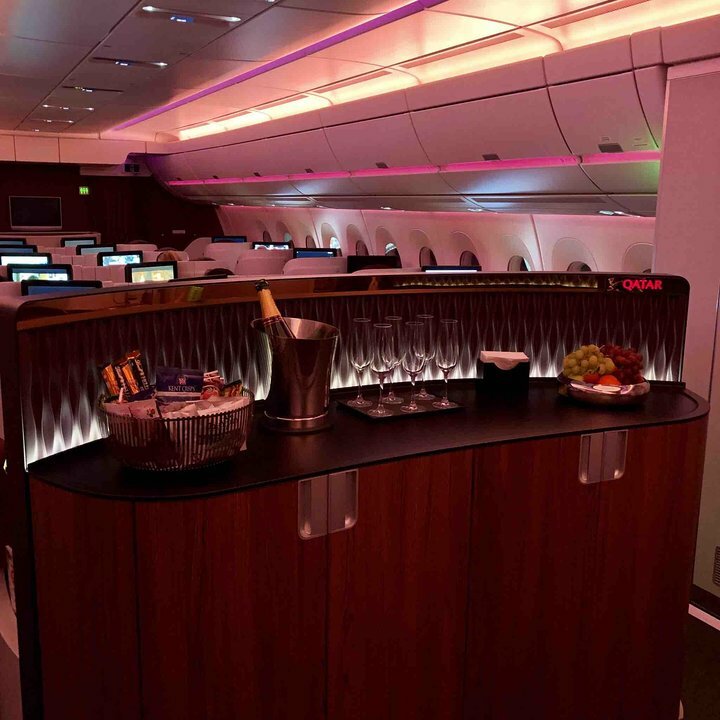 This aircraft flies with 36 seats in Business Class and 247 seats in Economy. 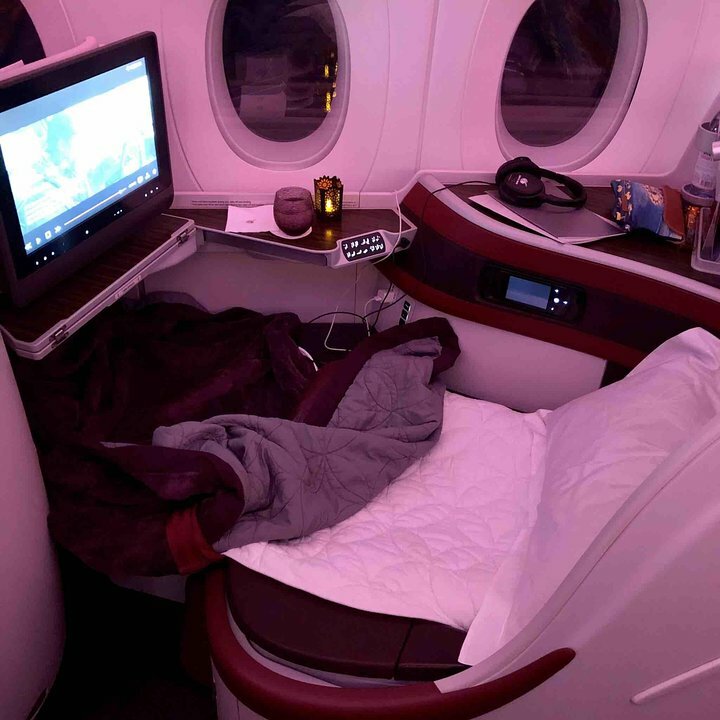 The flight I flew with Qatar Airways Airbus A350 - 900 XWB was the QR 102 from Geneva to Doha, which was also my first flight with Qatar Airways and my seat on that flight was the 30C. Personally, I have to admit that the seat was so comfortable and I even had extra legroom plus the crew members were so well-trained. I hope I have a chance to fly with Qatar Airways again in 2019. My wife and I fly EDI-DOH & DOH-EDI on this amazing aircraft in 7E & 7F. On the outbound flight we were the only passengers in the rear business class cabin and we still had different crew team members looking after us. The crew were amazing throughout and couldn't do enough for us. The seat layout seemed a little strange to begin with as the centre aisle seemed to make us feel quite apart, but that soon disappeared as you are served the most delicious food and drink whenever you want it. Yes, dining on demand! We flew on from DOH to Perth on a A380 and returned to Doha on a B777 LR, which I will make comment on too. We have flown many airlines, but Qatar beat them hands down! This is possibly the best seat(along with 8A) in business. The back cabin is largely more private, I had no one sitting accross in 8F so the seat felt even more private. This seat is right next to the engine, but the only noise is really on the climb out. Other than the seat, Qatar has a winner with its AVOD, Service, and food. The A350 is also a great plane. I flew MIA to DOH on May 31. This was one of the quietest, smoothest plane ride I think I have ever had. At times you couldn't even tell you were on a plane! It was a fairly new plane. Business Class seat 4K. Seats are 1, 2, 1 across. The window seats have air vents above them so if you like a cooler seat, pick a window seat. This was a fairly large cabin, separated by the entry area. You could not ask for better service. Before you went to sleep if you wanted, they made up your bed. The extra cover they put on made for a very comfortable bed. Tons of food, it was a little limited in choices, but what they served was good. You could always ask for more! a 14 hour flight was painless. You can actually sleep. I thought the entertainment choices were limited. It was worth the extra money to be in Business. All the seats are the same. the 2 in the middle have a partition wall that goes down if you want privacy or not traveling with someone. Plenty of overhead storage, a small storage compartment by your side, ports for charging electronics. They provide headsets if you don't have one. They also provided pajamas if you wanted. Was an absolute pleasure flying on the A350 - my first experience in a wide body aircraft. Qatar have some of the best legroom in the game when it comes to economy . Will go out and say they are almost like business class you find on short haul in europe . Beautiful moodlightin plus the silent and fresh cabin during flight- the a350 delivers in all areas. The rear Business Class cabin was 1/3 full (4 of 12 seats occupied) on DOH-JFK. The front section was at 100% occupancy. There was not a lot of foot traffic in our portion of the cabin and it made for a pleasant and quiet flight. The proximity 8A/K and 9A/K to the Economy Class cabin was no problem. Please note that overhead baggage space is limited for the last 3-4 rows as midsection bins are not available towards the tail end of the aircraft. Very comfortable seat in a light and roomy cabin, a lot better than equivalent seats on Qatar's 787s. Standard business seat. Very comfortable with a lot of space to stretch out. I found the service on board to be very nice, although a bit robotic/cold. That being said, my girlfriend was sitting in 9F and had another flight attendant which was nice but slow and clumsy (she even spilled drink on her legs!). The food was not much better than what you get in economy (the croissant was particularly bad, and the bircher muesli made with cheap yoghurt). 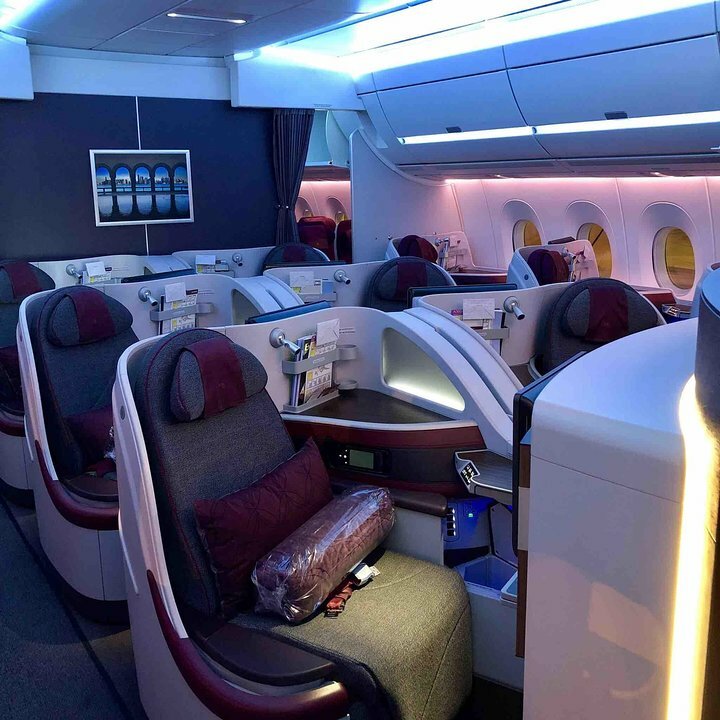 Wonderful aircraft & rank Qatar's Business Class layout one of the best, "except" seats in row 6. Perhaps the absolute WORST business class seats & have encountered on ANY of the 10 top-ranked airlines. NOISE NOISE NOISE for 8 hours on both flights, & NOT just from the VERY nearby toilet doors. Have never - NEVER - encountered a more clueless & noisey crew on ANY airline. Qatar needs to hire someone from Singapore Air, or Cathay Pacific, or Qantas or EVA or a 1/2 dozen other high service airlines, to TRAIN their crew on how to perform their job QUIETLY. Row 6 & 7 are directly next to a center bar on this Qatar layout, which is basically totally unused by passengers. However, it is where the crew stores lots of things they need, including their own belongings. Never-ending bang, Bang, BANG, of the storage doors every time a crew member opens them. It is like they are clueless that there are passengers actually in business class, &/or occupying seats in rows 6 & 7. Same with the toilet dooes. To their credit, the Qatar crew dows one of the best jobs in the air of keeping the toilets clean & tidy, but BAM, BAM every time they open & close the toilet doors. PLEASE Qatar flight management, TRAIN your crew on how to do their work with at least some consideration of noise. Otherwise, Qatar service remains some of the best in the air. Wonderful flight from Singapour to Doha. A lot of space, even for my husband who is very tall. Big screen, USB, and we were lucky to have only around 50 people in the plane. The leg room on this seat is not restricted it is much better then a regular seat. The compartment in the middle can be a bit bothersome because flight attendants from economy and business class get things out of it quite often. Also there is a lot of flight attendant traffic but virtually no passengers. Do not sit on this row. These seats are used for families with babies and small children. People also tend to use this area as a short cut so you are constitantly disturbed. 9K and aft business class cabin in general is located next to the engines and it is significantly noisier than fwd business class cabin. Very comfortable seat and slept well on our ADL-DOH flight. Sadly we were diverted to Perth due to a Medical Emergency and arrived in Doha 5 1/2 hours late. The only downside with this plane, is that the entertainment system kept switching off part way through watching something. The whole system then needed to be reset. Very frustrating! Service and food were great. ADEL-DOHA, round trip. the new A350, is an awesome aircraft, quiet, comfortable and great position, you get 2 windows in both 5K and 5A, fantastic sky bed. Runs rings around the 787 dream liner for comfort. If your leg has the A350 on it you will love the trip. The Qatar 350 is laid out for comfort. Airbus/Qatar on winner here so far, 10/10. MUC DOH flight on A350. The storage area for seats 1A, 1K, 7A & 7K are sealed shut & not usuable. Ended up using the tiny area of where the headphones were stored. This new airbus is much quieter than the Dreamliner (Boeing 787). Unfortunately they take it off PHL-DOH route during the high demand season(summer) and replace it with B777 since the B777 gets 100+ passengers. Stay away from seat 17 J, it has less leg room. There is a metal box for passing wires under the seat in front of it. No good for long trips, and not enough for laptop bag storage. Avoid 29H at all cost. 90% sure that 29C suffers from the same issue. I like last rows seats because I have more freedom about the recline without making other travellers uncomfortable, but not on this plane. You can reach into the lavatory on the left while seating at 29H, that's how close it is. On top of that, the aisle widens behind this seat, and there is a second lavatory there so expect being bumped into by passers-by. Lucky for me I sat there for only 20 minutes before taxi, after which the flight attendant moved me to unoccupied 23H,J,K - most likely because I had Silver tier with their Privilege Club back then, and QR's crew do take good care of Frequent Flyers. There can be some noise from economy class behind the seat. Great seat with fantastic QR service. No overhead bin if you are seated in E or F.
I was excited to fly on the A350 from DOH-SIN. When I walked on the plane you could tell a difference. No center luggage bin in biz - super open and airy. Plane felt bigger than it was. Biz class seat was a nice enclosed pod with plenty of privacy. Just enough space to put your stuff, although no backpack storage when you lay down your seat. IFE was awesome. Particularly on takeoff and landing I loved the ability to see the exterior of the aircraft camera. Fascinating. Biz class pods are much like the Cathay Pacific and American Airlines 777-300ER seating except with what I perceived to be slightly lower pod wall height. Windows were HUGE - and very clear with private jet-like touches of a touch button window raise/lower. Qatar service and food again top notch. Extremely smooth biz class experience - recommend this seat and this plane to anyone! First time flying with Qatar and will be last time. Round trip from Munich via Doha to Dehli on Nov.6th and returning from Goa via Doha to Munich. My husband and I hated each segment of our flights. We found the seats uncomfortable, leg room cramped although we are only 1,64 and 1,78 cm tall. Even the aisle is narrower making it difficult for service personal to push around the foodcarts. The planes feel cheap! Excellent new aircraft. I was surprised about the low noise level. Better then in the 787. Quality of seat and service as expected from a 5 Star Airline. Great flight. I was so excited to fly on brand new A350 last month. It was 7 hours flight from Doha to Frankfurt by Qatar airways. 31 H is alley seat, no IFE box that bother, enough space for 170 cm person, with less than 50 kg weight. IFE features are great, A350 equiped with tail camera and under aircraft camera, just tap the my A350 and then you can view both cam, its awesome, u can view your journey not just on the map. Oh the map offered u to have cockpit view of your journey. beside the IFE Screen, there is also a lcd tv that broadcasted take off and landing. my seat located just 1 seat from the exit and the galley, also the toilet. its not to bothersome for me. meal are great, not too noisy, and i was having smooth fligh. Qatar Airways flies 1 versions of Airbus A350.